Even Matty the Matador showed up to show his support of the CSUN community. Photo by David J. Hawkins. 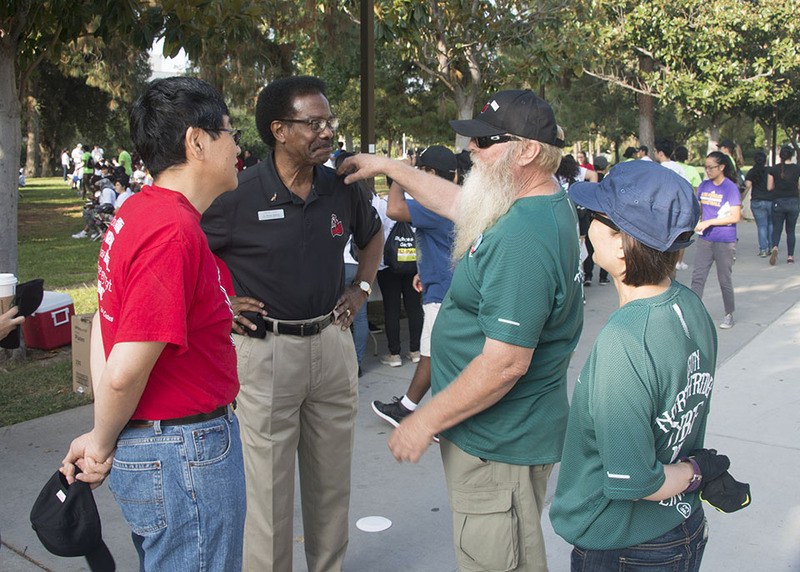 Provost Yi Li and Vice President for Student Affairs William Watkins talk with community member Don Larson at the third annual Matadors Day of Service. Photo by David J. Hawkins. 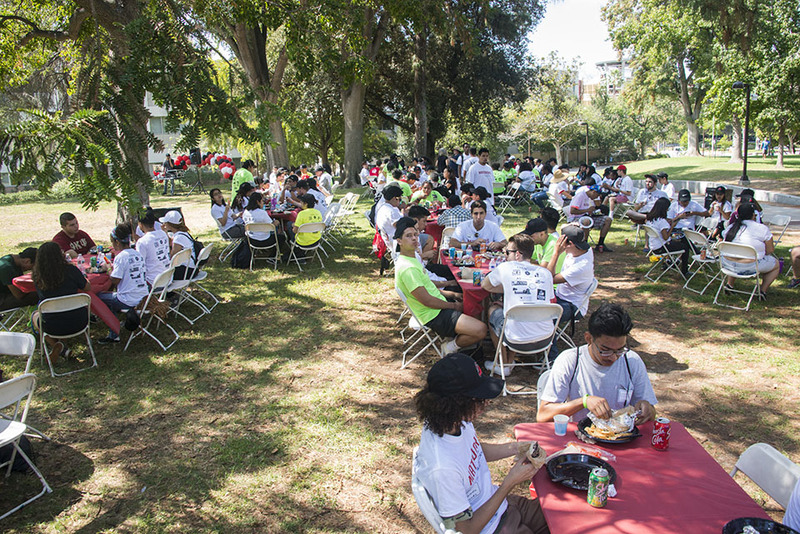 Students, faculty, staff and community members were all welcome to help beautify the CSUN community. Photo by David J. Hawkins. 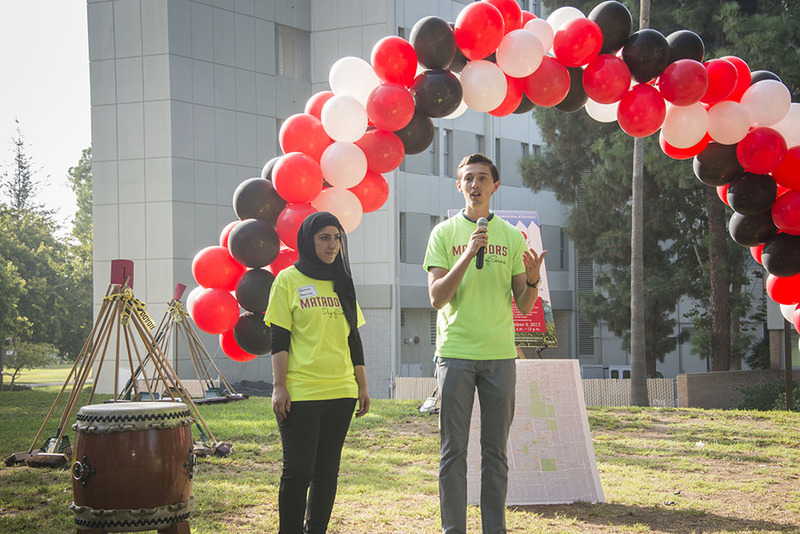 Associated Students President Jonathan Goldenberg (left) and Vice President Zahraa Khuraibet (right) thanked volunteers for coming out to Matadors Day of Service. Photo by David J. Hawkins. 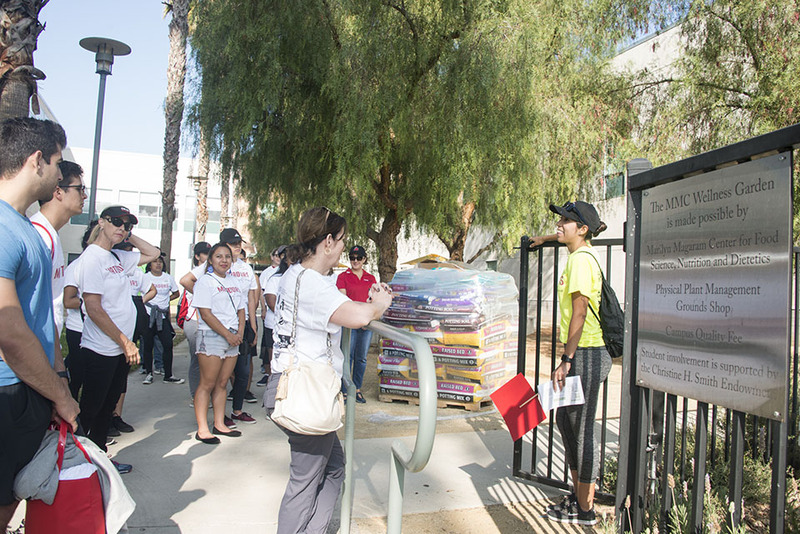 Volunteers were excited to serve the CSUN community by helping out at the CSUN Food Pantry, San Fernando Valley Rescue Mission and the Lab School, among others. Photo by David J. Hawkins. A group of volunteers helped out at the CSUN Wellness Garden. Photo by David J. Hawkins. Volunteers also helped clean up Reseda Boulevard at the 2017 Matadors Day of Service. Photo by David J. Hawkins. 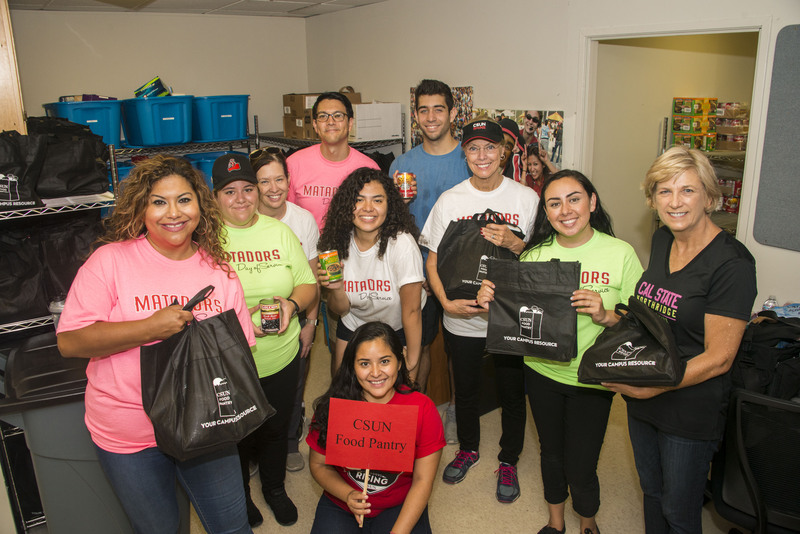 Students and staff at California State University, Northridge worked side by side with President Dianne F. Harrison to prepare the CSUN Food Pantry for opening day. Photo by David J. Hawkins. Volunteers' hard work was repaid with free food courtesy of Sharky's Woodfired Mexican Grill. Photo by David J. Hawkins. 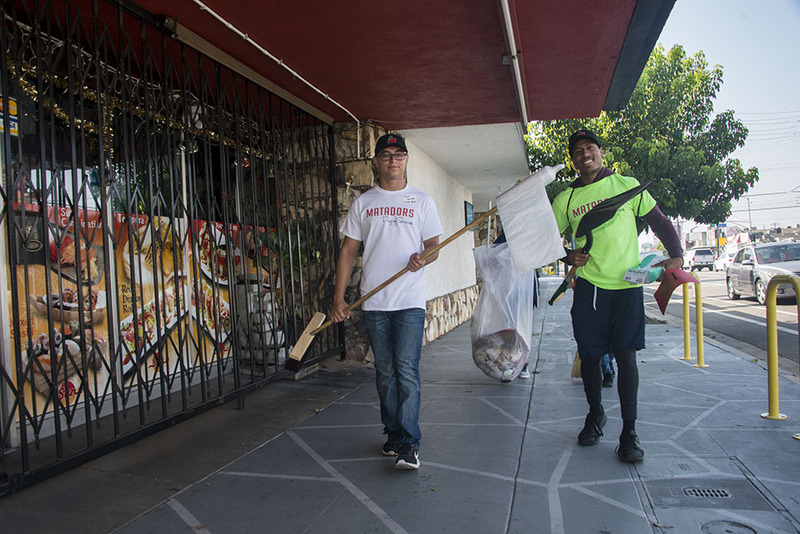 California State University, Northridge faculty, staff, students and community members picked up brooms, rakes and shovels at the third annual Matadors Day of Service on Sept. 9 as part of the campus and neighborhood beautification effort. 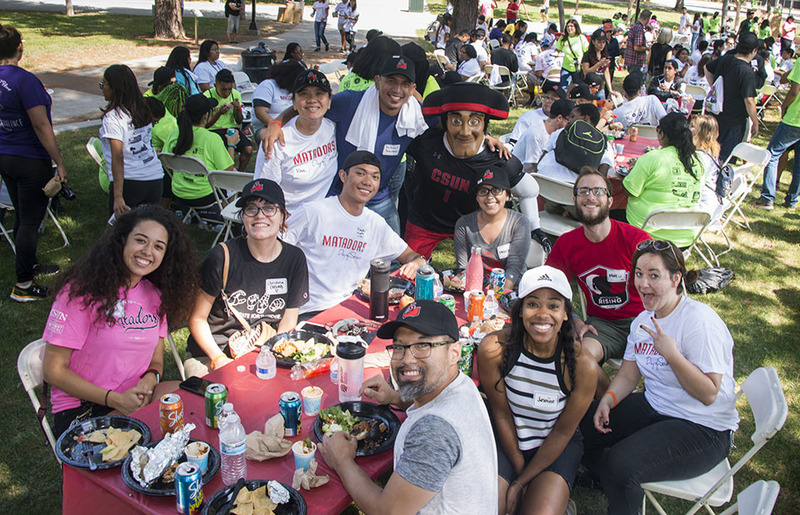 The volunteer opportunity was a collaborative effort between CSUN’s Office of Government and Community Relations, Northridge Beautification Foundation and Unified We Serve, who designed it to enhance the community’s appeal and further connect the university with its neighbors. For the first time ever, the event had an external sponsor in the Southern California Gas Company. David Meza, public affairs manager for SoCalGas, said he was impressed by CSUN students at Matadors Day of Service. Maria Elizondo, activities coordinator for Unified We Serve, said that the initial goal was to make first-year students feel welcome and expose them to volunteerism. The event has had a steady increase in volunteers since its first year. 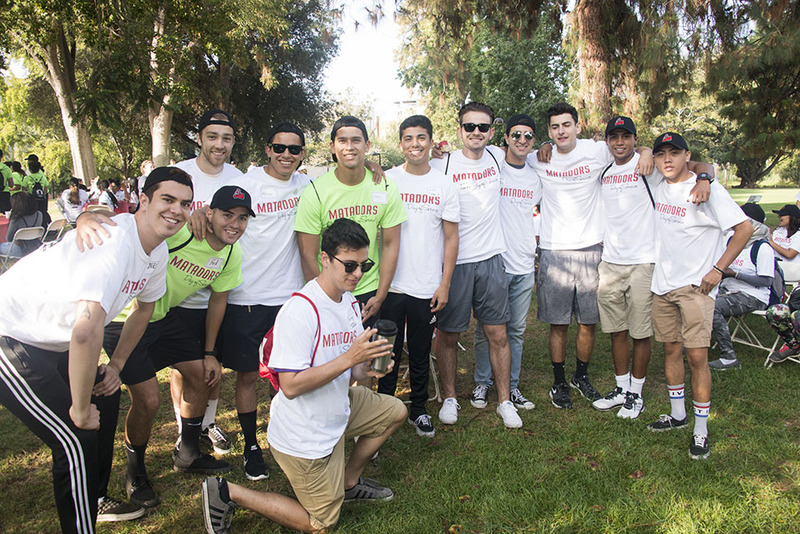 The first-ever Matadors Day of Service drew in about 350 volunteers and last year’s event gathered approximately 400 people. 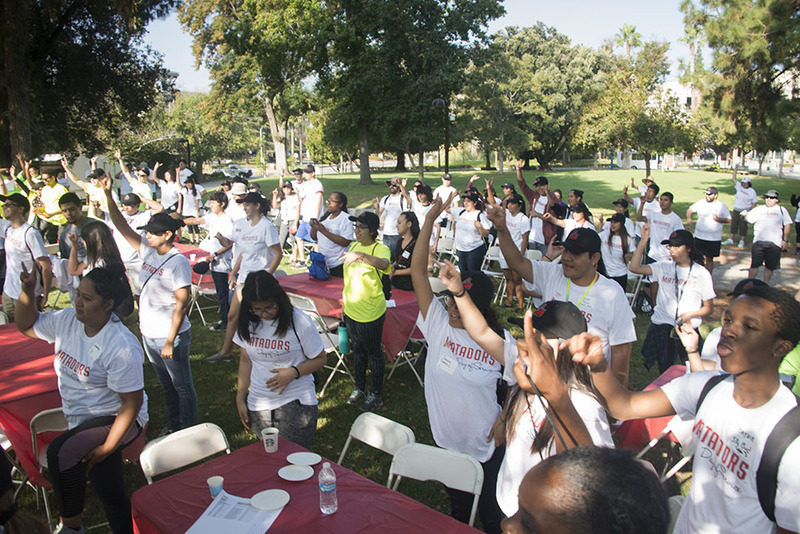 Over the last three years Matadors Day of Service has engaged more than 1,100 volunteers in service. First-year student Karen Melendez said she attended Matadors Day of Service because she wanted to be a productive member of the community she is now a part of. CSUN Director of Government and Community Relations Francesca Vega said she has a big vision for the future of Matadors Day of Service. Unified We Serve and Government and Community Relations had partners on and off campus. Their on-campus partners included the Office of Student Involvement and Development, the Office of Student Housing and Conference Services, Associated Students, the University Student Union, the University Corporation and Alumni Relations. Off-campus partners were the Northridge Beautification Foundation, the office of Los Angeles Councilmember Mitch Englander, local Neighborhood Councils (South, East, West), the Northridge Chamber of Commerce, Northridge Vision and the office of Assemblymember Matthew Dababneh. Assemblymember Dababneh, who spoke to the student volunteers during the opening program, said that he was excited to be a part of Matadors Day of Service. “To be in the Valley with so many CSUN students, faculty and alumni, and help contribute to making our community a better place to live, I’m all for that,” he said. For more information on other volunteering opportunities in the future, visit the Matador Involvement Center website.